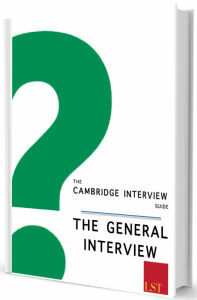 In response a team of Cambridge and Oxford graduates have worked to put together“Cambridge Interview Guide – The General Interview”. Download a sample page here. Are there any questions that you would have liked us to have asked you? Describe the sound of silence. Do you have political views? Do you think that you are smart? Do you think that you can cope with the heavy workload here? What gives you this confidence? How should we measure your success at the end of your time here? How will your experiences from your sport benefit your future studies? How would you describe this painting on the wall to your friend over the phone? If you could change one thing on the planet now what would you change? If you could have dinner with anybody from history, who would it be and why? If you could have one superpower which one would it be and why? If you had to choose to be a character from a book, who would you want to be? In which circumstances would you toss a coin to make a decision? Of which life achievement are you most proud? Should you be allowed to use your smartphone during this interview? Studying here is very intense, how will you manage your time to deal with all of the work? Tell me about a recent magazine article that has interested you. Tell me about a recent news article not related to your subject that has interested you. Tell me about your life and how it is that you have come to sit in this chair? What are you looking forward to the least at this college/university? What are your long term plans for life? What did you read this morning? Yesterday evening? What do you expect to get out of this degree? What do you know about the course structure? What do you think that you could personally contribute to college life? What have you done in the past that makes you think that you are well equipped to deal with the stresses of university life here? What is the biggest challenge you’ve faced in your life and how did you dealt with it? What makes you think that this university will be a good fit for you? What makes you want to come to here given that you would almost certainly be the top student at any other university? What was the most recent TV programme you watched? Where do you see yourself in 10 years time? And in 20 years? Where would you like to travel to the future in a time machine? Which colour best represents you? Which extracurricular activities do you enjoy? Which international newspapers or magazines do you read? Which living person would you most like to meet and why? Who has had the largest influence on your life? Who is the most influential: Barack Obama, Angela Merkel or Kanye West? Who was your best teacher? How have they influenced you? Why have you chosen to apply to study at this university? Why should anybody bother with university? Why would you like to come to this college? If you had to bury a time capsule, what would you put in it? What is a lie? How do I know what you just said isn’t a lie? Define success in one sentence. Does human behaviour change over time? How does a cheetah move so fast? How many letters does the Royal Mail deliver every day? How many petrol stations are there in England? How many piano tuners are there in England? How many planes are flying over England right now? How many tennis balls could fit into a Boeing 747 plane? How many times in a day do the hands on a clock overlap? How much should you charge to clean all of the windows in your home town? If you were me, would you let yourself in? Imagine that a developing country introduces a new population control policy to address a perceived gender imbalance. If a couple have a girl, they may have another child. If they have a boy, they cannot have any more children. What will be the new ratio of boys and girls? Is there such a thing as beauty? What do you think my favourite food is? Why do you say that? What is more important: art or science? What shape is the sky? Why do things have names? Would you ever go on a one way trip to Mars? Why? You are given 7 identical balls and another ball that looks the same as the others but is heavier than them. You can use a balance only two times. How would you identify which is the heavy ball? You are shrunk down so you’re the size of a matchstick and then put into a blender with metal blades. It is about to be turned on what do you do? Why would you like to study this subject at university level? With which famous person would you most like to be stuck on a desert island? Would you choose a party over an essay?